CLEAR FORK VALLEY — The owner of Griffon Jewelers, speaking at the most recent meeting of the Bellville Jefferson Township Historical Society, gave area residents information about the antiquity of jewelry. David Griffon said jewelry goes back at least to ancient Egypt and Babylon. Fine jewelry is frequently found in the tombs of the pharaohs, he said. Griffon brought two boxes. One was labeled New Tools and the other was labeled Old Tools. First he discussed the use of the tools he currently uses. Then he pulled out the Old Tools, and they were identical to the New Tools. The point was that the art of jewelry making has not changed appreciably in the last century. The one major change brought about by computers is CAD (computer-aided design) which allows a design to be stored and duplicated. Hand made jewelry has the value of being unique and cannot be duplicated exactly. Griffon also talked about diamond mining and cutting. He said the majority of the diamonds available for jewelry in the USA are cut in India. The one major change in diamond cutting came in the 1920’s. The light refracted in the diamond was increased dramatically by the new cut. Stones other than diamonds have been set into jewelry historically, and synthetic sapphires and rubies have been created for over a century. So just because a ruby ring is old does not guarantee the ruby is natural. During the question and answer session, Mary Louise Thomas showed Dave some of her antique jewelry. Most of the jewelry was appraised as costume jewelry. However, she did have a beautifully engraved bracelet, which brought up the name of an engraver from at least 40 years ago. 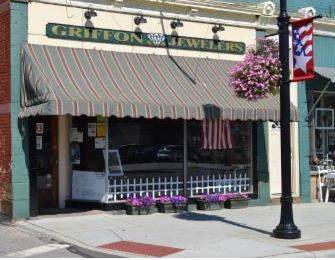 Griffon also talked a little bit about the building that houses the jewelry store. Some people remember when Stone’s and subsequently Barnhill’s grocery stores were housed there. As part of the preservation of history Griffon has framed the section of the wall that was probably by the telephone; it contains notes and pictures from long past. Griffon gave all those attending a jar of jewelry cleaner. The next meeting of the Historical Society will be July 16. The speaker will be Tom Wade. Gatton Rocks has an interesting history as a resort and vacation spot for folks who came from the cities by train. The meeting begins at 7:00 in the Community Room of the Historical Society museum.